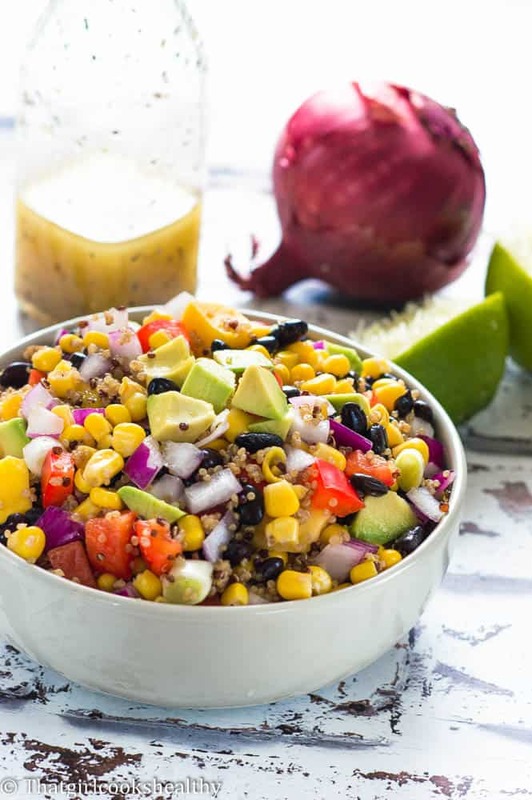 Black bean and corn salad – A tasty vegetable legume combination salad that takes less than 15 minutes to prepare that’s packed with flavour and sweetness. If you’re fan of salad or even just looking to hop right on the wagon, then you are in the right place. 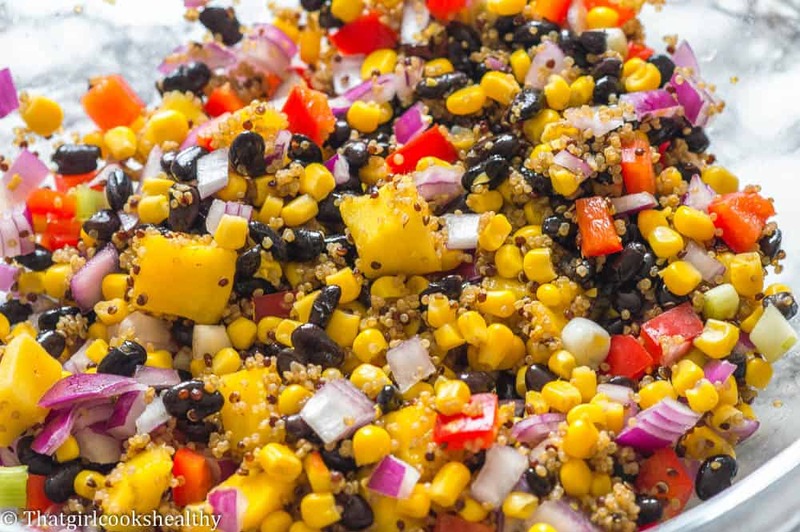 I hope that this nutritional black bean and corn salad wins you over. It’s made from scratch, using ingredients that are easy to obtain from your local supermarket and doesn’t take long to prepare (bonus). The foundation to making this salad is very, very simple. If you’re a health enthusiast then lucky for you that you’ll probably have some of the listed ingredients to hand. If not, no worries I guide a long this culinary journey. 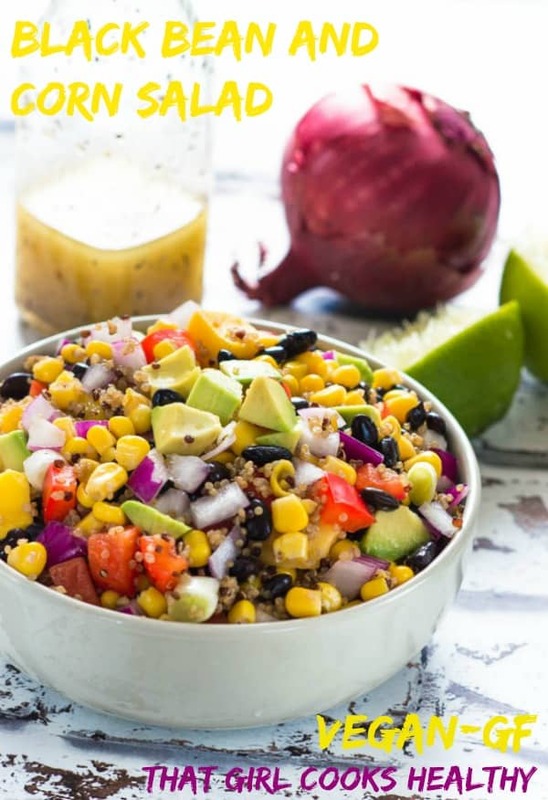 The main ingredients – corn, black beans, quinoa, mango, red onion, scallion, avocado and red bell pepper. The salad is drizzled in a sweet lime dressing too but I will listed the secondary ingredients further down. Chop your veggies a head of time – a lot of what I have listed may seem like a laundry list of veggies. However, this won’t have any bearing on how long it takes to prep them. If you’re really pushed for time or simply want to be a head of yourself then I would suggest chopping up your veggies and storing them in a zip lock bag ready to use. 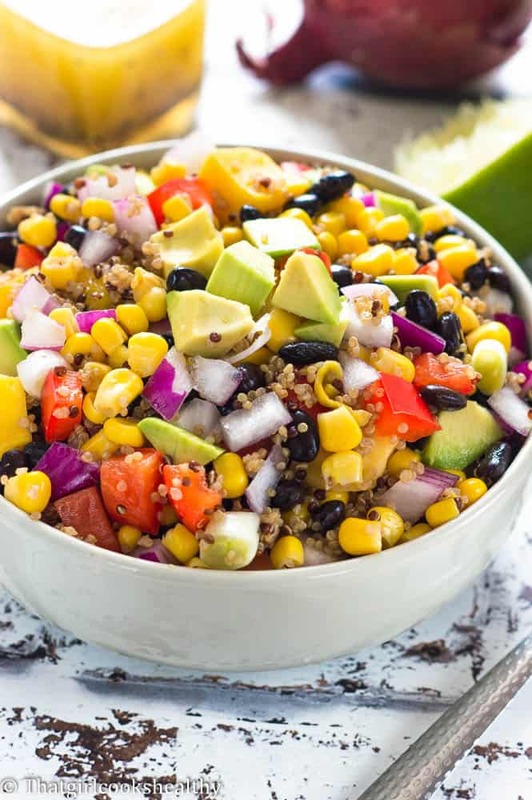 Use cooked quinoa – Unlike it’s grainy counterpart quinoa cooks in a matter of minutes. For this recipe I used cooked quinoa (red and white) that I had to hand. I do advise doing the same so it’s cold and ready to toss into your salad. Just like apples, avocado have a tendency to slightly darken in colour. This occurs when the flesh is exposed to the air. Granted it doesn’t look very appetising though it’s still perfectly safe to eat. You can omit this from happening (to a degree) by cutting your avocado and leaving it to soak in some salt water. I would advise cutting, soak and rinsing your avocado as soon as you’re ready to eat the salad. Don’t leave it soak overnight or for a length of time. In other words, let it be one of the last things to add to your salad bowl. Salad are a creative way of incorporating your 5 a day fruit and veggies. The salad has flavour – no boring, bland rabbit food around here!! It’s suitable for vegans and contains NO gluten. You can also switch things up a little and add some meat if you’re not a vegan for an extra serving of protein. Alternatively, you can add more fruit and not just go with the mango or even include more veggies. It’s such a diverse salad but really all you need is right in my recipe. 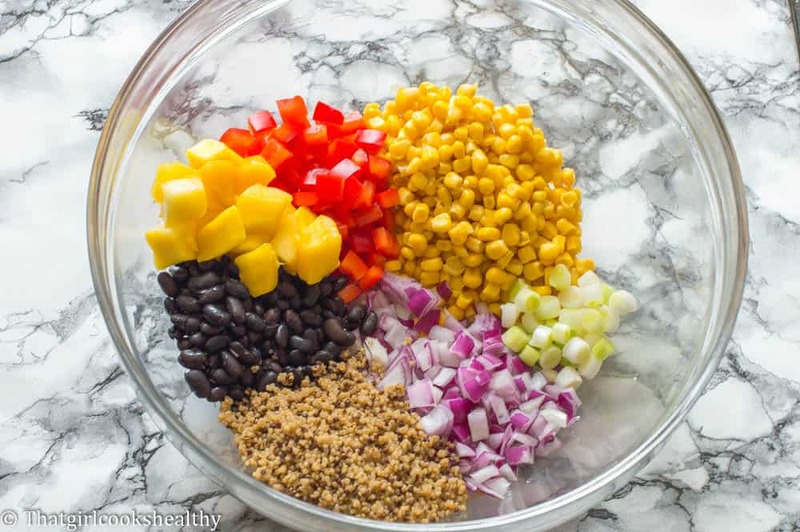 Mix together the ingredients for the dressing and place in a jar with a lid and set aside. Combine all of the fruit and vegetables for the salad in a bowl. Add the chopped avocado only if you plan on eating straight away. This is a really wonderful combination of ingredients, I cannot wait to make this at home! Thank you! It’s my go to salad right now. I see no lime in the sweet lime dressing? Apologies Holly, I have just adjusted the recipe card. It should be the juice from one lime that is squeezed. This is a beautiful summer salad! Can’t wait to make it! 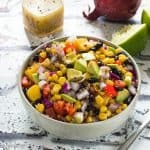 This Black Bean and Corn salad looks refreshing! The perfect summer dish! This looks so fresh and flavorful. I have to make it! Such beautiful summery colors! Sounds like a yummy salad! Love Mexican Food!! I must try!! I’m really craving this! I love these flavors all together in the summer. A beautiful salad. I throw salads like this together in the summer but never include quinoa or other cooked grains. I think it would add to the texture greatly! thanks! Thanks mimi. Like yourself I don’t normally add quiona or grains to my salad but because this one is so light it’s works perfectly.